Bout of Books: Bout of Books 11 SIGN-UP! Bout of Books 11 SIGN-UP! Are you ready to SIGN UP? THIS IS WHERE YOU SIGN UP. 1. Post on your site, Twitter, Google+, Goodreads, YouTube or Facebook account and declare your intentions to join us. It's EASY. We ask you share info to help spread the word. Please link back to us so others can find us here. 3. On August 18th, READ! Remember: you must post a DIRECT LINK to your sign up post. 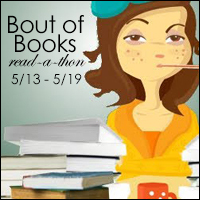 If you're only participating on Twitter/YouTube, link up your "I'm participating in Bout of Books!" tweet/video, NOT your Twitter/YouTube profile. Lol, am I the only one who has also set my reading goals for Bout of Books 11.0 already??? Was I suppose to wait until closer to the read-a-thon?? You're welcome to set your goals any time you like. You only need to link up in the linky. I'm here #69, but realizing right now I need actually to spend more time reviewing books than reading more. I should reach my goal of 105 books this year, fine with me, but I am sooooo behind my reviews. Hopefully I can catch up enough and participate in Bout of Books 12!! Wowee! Excited to participate this time. I'm #471, goodness this readathon keeps getting bigger and better. Hope I can do some of the mini challenges this time, there are some fun ones! I am confused on how to sign-up, can you please help me? I posted this earlier, but I am not sure if it went up, so sorry if I accidentally make a double post! 1. Tell the world you're participating in the readathon. It can be on your blog, Twitter, YouTube channel, Tumblr, wherever. 2. Link up your "I'm participating in #boutofbooks!" post, tweet, video, update, whatever, HERE in the linky. If you need examples, follow Kelly's example we provide in the post if you're updating on your blog. If you're participating with Twitter, use the Click to Tweet and link that tweet. (It's the one that says, "Tweet about Bout of Books".) If you're on YouTube, I'm sure there are excellent videos you can use as an example. Nevermind, I get it now! So do i just list the books i read at Twitter then? If you like, yes. You update however you want, on whatever social media network you want. *Makes Grand Entrance at #791* If only I'd waited a little bit longer I might have been 800 darn it! lol! Ok and do you post your goals there too? This is my first RaT. I started yesterday with the first book already because I wanted to read it anyway, before I decided to join the readalong. So that's why my post is a bit late! Vienna, your link needs to go in the linky, not the comment section. worried that my link isn't working..i just clicked on it and it says PAGE NOT FOUND. want to make sure i'm signing up correctly before sign in closes! You need to grab the url of your tweet (I'm assuming you're signing up through Twitter, if not, the url of wherever you declared your intention to join) and post that in the url box of the linky. It looks like you posted the message of the tweet itself. Delete your entry and try again and you should be fine. Are you #162? That looks correct. I am so happy i met my goal with an hour to spare. I can't believe I read 12 books in one week =D I can't wait for the next one. #boutofbooks Google+ on-air chat tomorrow!